The Interior Design Technology programs, at both the Associate in Science and Bachelor of Science degree levels at New England Institute of Technology (NEIT), prepare students to be proficient in the art and technology of designing residential and commercial interiors. With each project, students must incorporate the client’s economic, technical, functional, social, psychological, and aesthetic requirements. Interior design fundamentals of programming, space planning, sketches/diagrams, concept development, materials and finishes, floor plans, renderings and presentations, are combined with a comprehensive study of building systems, components, and construction. What is the difference between an interior designer and an interior decorator? While the end product may be similar, designers and decorators perform many different tasks. An interior designer focuses on color, style, texture, durability, acoustics, cleanability, flame retardancy, allergens, toxicity, and off gassing properties as well as American Disabilities Act standards. On the other hand, the interior decorator focuses on color, style and texture with no formal education required. The interior design professional functions as an integral member of the building team taking into consideration the standards of their profession, public safety, and regulatory requirements. 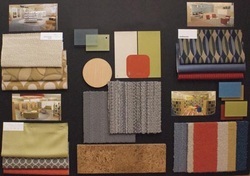 New England Tech’s Interior Design students are introduced to the basic elements and theories of design, color and spatial composition that form the foundation of creative design. Through topic-specific courses, students are introduced to both manual and CAD drawing skills. Theory and technical courses familiarize the student with fundamentals in design that include materials, lighting, furniture, textiles, architectural history, specifications, building codes, and building systems. Green Technology and Sustainable Design are incorporated into the entire curriculum. Studio courses require students to incorporate their theoretical and technical knowledge into a comprehensive design based upon specific program requirements. Associate level studio project types include residential, commercial, and retail while bachelor level students focus on space planning, hospitality, and institutional design. Students also have the opportunity to visit local design showrooms and offices and participate in presentations given by NEIT’s interior design graduates as well as professionals in the field. These design professionals are often invited to participate in critiquing students’ final projects. The team approach is also emphasized in the Interior Design Technology program by having students participate in multiple classes with NEIT’s Architectural Building and Engineering Technology students as together they focus on technical drafting, building principles, and perspective drawing. As each of the programs progress, eventually the two technologies separate from each other, each concentrating on their respective disciplines of design. At the culmination of both Bachelor of Science degree programs, students reconnect to learn more about the real world facets of these fields through construction law, lighting design, estimating and bidding, as well as contracts and specifications. These programs function as their own distinct technologies, yet are integrated so together they highlight the main principles of what the field of design has to offer. held this past May. Students from both the associate and bachelor degree programs showcased their projects, portfolios, and creative works for family, friends, students, faculty and prospective employers to enjoy. To learn more about the associate and bachelor level programs in Interior Design Technology, contact New England Tech’s Admissions office at 1-800-736-7744, 401-467-7744, or visit www.neit.edu. With more than 3000 students, NEIT is accredited by the New England Association of Schools and Colleges, Inc.